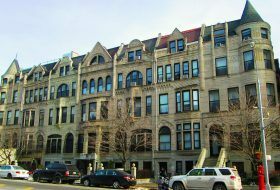 Located in the historic Sugar Hill district in Hamilton Heights, 16 newly renovated affordable units are available to rent at 369 Edgecombe Avenue and 801 St. Nicholas Avenue. The neighborhood is chock full of Queen Anne- and Romanesque Revival-style homes, and it has easy access to Jackie Robinson park, which includes a recreation center, baseball fields, and a swimming pool. The buildings featured in the city’s housing lottery are open to New Yorkers earning 50 and 60 percent of the area median income, with units ranging from $747/month one-bedrooms to $1,196/month three-bedrooms.